Denny Jump (Bellevue, WA, United States) on 21 September 2011 in Lifestyle & Culture. It's early Autumn and the apples in Vermont are ready. I took these shots (today and the following 3 or 4) a few years ago. 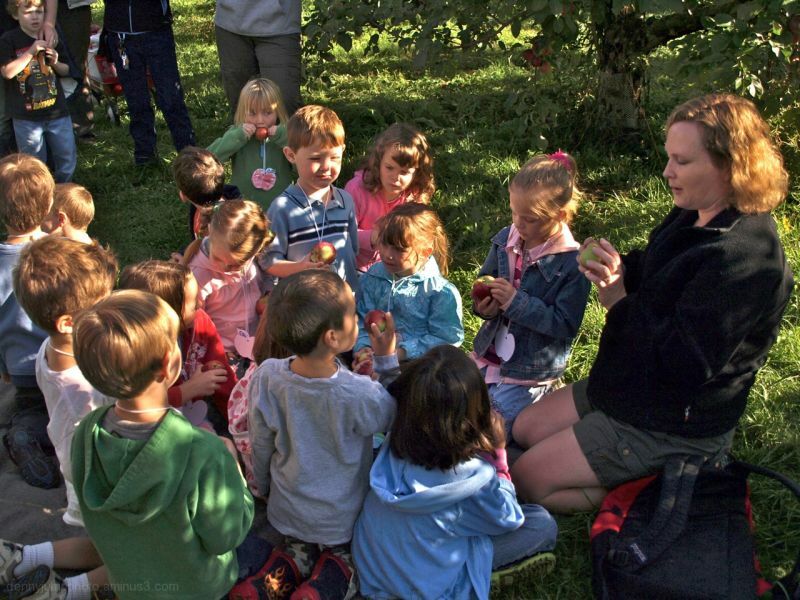 This is our daughter Amy, teaching her students all about apples. She actually took some rather involved training from the owners of the apple orchard in order to teach this subject. There's a great deal about apples that I never knew, that's for sure! Amy is pretty much of an expert now. The students, of course, were all ears...and eyes....and tastebuds.... Observe how intently they are focusing...this was serious business to them. And, I have to say, Amy really has a way with kids...they love her. Richard is right, a good teacher is such a gift in a child's life, I am sure Amy is a wonderful teacher - she sure does have the children's attention in this photo. This is a lovely image. I am sure everyone had a very enjoyable day. Well shot, lovely light . The joy of youthful discovery. The hope of the future. Delightful shot, Denny - love the dappled sun and shade; and the kids seem enthralled by what Amy has to say. A reminder of nature's simple, polished beauty. A naturally good teacher can do this with kids….and your daughter is obviously one with that talent and appeal. Nice shot of this educational setting. @Don: I totally agree, Don..Thank you so much, sir! That's a wonderful shot. A great tribute to apples and your daughter. :) I love how the children are all gathered and she is clearly teaching them. The apple is the symbol for the teacher after all. Does that go back to Eden and the tree of knowledge I wonder? A sweet shot! Cute shot and a wonderful "learning" moment. Lovely shot of your daughter and her students interacting...what a treat for you! Have a nice day! @RBL: Hi Ruthie - Thank you very much ;-) Have a great evening! Wonderful warm feeling from the image. After reading your text, I felt it warmer. This is beautiful and heart warming. I love seeing these types of scenes. Also, the dappled light from the leaves on everyone is so enhancing for the vibe you share. An adorable, candid capture with so many little minds intent on learning. I love the warm sunlight captured on their faces. Wonderful image. The kids are all into learning about apples. I like the little girl in the background. She has just decided to eat it! Wonderful! @Elaine Hancock: I know I saw that too...isn't she the cutest...chomp, chomp! I love the engagement of all the children ... and the golden glow on a dozen heads. Amy certainly has their attention! @john4jack: Hi Jack - Thank you very much! Wow, Amy sounds like a wonderfully dedicated teacher to learn so much about the subject in order to be able to teach it properly. It always pleases me to hear of teachers putting in that little extra effort that can make so much of a difference in children's lives. Wonderful story and shot Denny! I wonderful moment with teacher and her pupils! I have a lot of love and respect for teachers and not just because I've been married to one for 40 years. Encouraging kids to learn is one of the great rewards in Life for those so gifted. It is not the same as 'teaching' them, as I am sure your daughter knows. @Ronnie 2¢: Truer words have never been spoken, Ronnie.. I completely agree...and I truly thank you for the wonderful compliment to Amy! Light on their sweet faces & shoulders is exquisite, love the scene & atmosphere ! Those kids seem to be fully engaged. A super shot, Denny.